Comfort food. What does that phrase mean to you? For me, comfort food means my favorite food memories of childhood: my mom’s Potato Leek Soup, Gigi’s lasagna, Nana’s cornmeal mush with butter and brown sugar, my dad’s soft-boiled eggs on buttered toast, homemade cinnamon swirl bread fresh from the oven, and even the chocolate pudding with whipped cream that was an occasional special treat from the elementary school cafeteria. The list goes on and on, and seems to change as I grow older. But one thing that is always near the top is my mom’s Tuna Noodle Casserole. It’s by no means an exclusive recipe. I’m not sure where her version originated, but similar recipes can be found just about everywhere. Regardless of where it came from, this is now a family recipe and it’s the one that my sister and I will make for our own kids someday. I don’t make many dishes that use condensed canned soup as a base. I’m not judging, I know that many a good casserole gets thrown together using cream of mushroom, cream of celery, or cream of chicken soup. I just didn’t grow up eating many of those casseroles. In fact, tuna noodle is the only casserole I remember eating as a kid, other than mac and cheese. As I learn more about cooking, I find that I generally prefer creating things from scratch, using whole ingredients rather than processed ones. But certainly not always. I see no problem with keeping a few cans of condensed soup on hand, especially cream of mushroom. I don’t eat canned cream of mushroom soup by itself, but it’s great for casseroles. (It even says so on the front of the can!) I also sometimes like to simmer pork chops in it, which, when served over rice, makes for an easy and satisfying main course. When I moved away from home at age 19, my mom put together a family cookbook for me. She added hand written recipe cards with several of my favorite recipes from childhood. The book also came with extra plastic sleeves and blank recipe cards so that I could add my own favorites in the years to come. I have added lots of recipes over the years and someday my daughter will inherit this old cookbook filled with recipe cards in her grandmother’s and mother’s handwriting. And I will also create one just for her. The cookbook, tattered from years of use and several moves, is still one that I turn to whenever I need a taste of home. And since we lost my when I was in college, seeing her handwriting on the recipe cards can sometimes be just as comforting as the food. If you have children that are getting ready to leave the nest for the first time or even ones that have been on their own for years, think about creating a special cookbook for them. Even family recipes that come from a cookbook will hold special meaning in the future if they are written down by you. I made Tuna Noodle Casserole yesterday to take to my sister’s house for dinner. We both love it and these kinds of things taste even better when they’re shared with loved ones. I don’t think I’ve made the casserole for a few years and I admit that while putting it together I made a few needed changes to the hand written recipe. For one, I added a bit of milk because the mixture seemed a bit too dry. I also used homemade bread crumbs that I toasted in a little butter before sprinkling on the top. Like I said, small changes, and the casserole tasted better than ever. Dinner with my sister and brother-in-law turned out to be a lot of fun. As often happens over meals like this, we reminisced about some childhood memories. I had almost forgotten that our dog Lucy sometimes got leftover tuna noodle casserole in her dinner bowl. The reason we remember this is that Lucy, a big furry Newfoundland/Shepherd mix, would eat everything but the peas. She’d wolf down the casserole and manage to leave nothing but a pile of small green peas, each one licked carefully clean. We laugh every time we talk about it. I guess these memories are what really make a comfort food. So, what are your favorite comfort foods and what memories do they conjure up? I’ve shared some of mine at the bottom of this post, below the printable recipe. For those who would prefer to make a Tuna Noodle Casserole without canned soup, I have now created a new recipe made completely from scratch and it is delicious! In a large bowl, stir together first six ingredients until well combined. Spread into a small greased casserole dish then sprinkle bread crumbs and parmesan cheese evenly over the top. Bake uncovered in a preheated 350 degree oven for 30 minutes and serve warm. This recipe makes a fairly small casserole but it can easily be doubled if you have a large family or like to have lots of leftovers. *Don't overcook the pasta! Read the package for cooking time and use a timer. **If you don't want to use fresh bread crumbs, use the seasoned dried kind from the store and cut the amount in half. 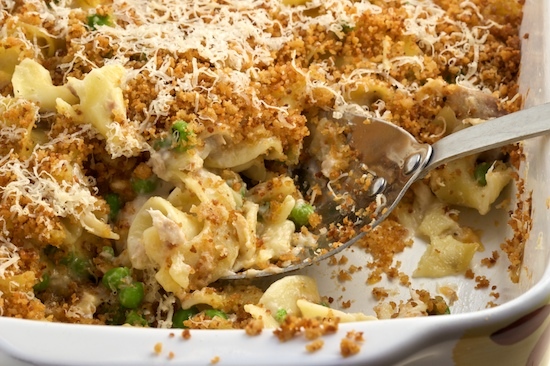 Toss the seasoned dried breadcrumbs in one tablespoon of melted butter before sprinkling over the top of casserole. ***I now use a good quality Parmigiano Reggiano to sprinkle on the top but we grew up using the stuff in a green can. Just use whatever parmesan cheese you normally keep on hand. Cheese Grits Casserole from You Gonna Eat All That? Grace: Thanks for the tip about the sherry! I probably only use it a few times a year myself, but I keep it on hand because I never know when the mood will strike! :-)Ali: Crazy! I agree, there's not one 'fancy' recipe in my book and I plan on keeping it that way. Just good, solid, simple recipes that will withstand the test of time! Hi there..I am going to hunt through your blog for new recipe ideas. It looks good. I post recipes as well. I have a yummy mac and cheese on there that is a great comfort food..of course soup is good too. Today I posted one for sweet potato biscuits...that is good too!! I love tuna noodle casserole! It was nice reading why it is a comfort food to you. I also love the story about your dog, my dog does the same thing! Almost 10 years ago my great grandma dictated all her family favorite recipes to my grandma, who then typed them and printed a cookbook.The cookbook was filled with recipes, stories and pictures of my great grandma. My great grandma gave those cookbooks to her family for a Christmas present, she died the following March. I turn to that cookbook a couple times a month for inspiration. Great post, Nicole! And beautiful handwriting. Yum. So happy you're back to blogging! We never had this growing up and I just my first try about a year ago...love it! This will be a great recipe to make in the cool fall days ahead. Thanks! Definitely comfort food Nicole. I love this dish, going to have to cook it for Emma and Abby. In fact, I should start collecting recipes for their future cookbooks! I'm so glad I have 2 girls that I can share this stuff with! 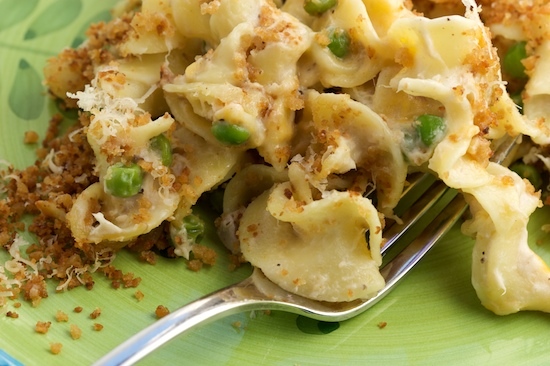 We all love tuna noodle casserole around here. I make mine with white sauce, though, just because I can and usually have the ingredients on hand. I know what you mean about seeing a dear one’s handwriting. Whenever I see my father’s handwriting (gone over four years now) I get very emotional, especially since he didn’t cook all that much. My fiancee loves tuna & i have never been a canned tuna person but your reflections on your mom and comfort food convinced me. He's going to be one happy & surprised man tonight! Also, we had a beagle who would lick the dressing off the salad but leave the greens! somehow your writing can always move me emotionally nicole! great post, and awesome pictures! i've never had tuna casserole, but it looks great! :-) btw, three posts in 1 week! your on fire! toontz: I made one once with white sauce and some other added ingredients. It was good but just didn't feel like the tuna casserole I love! :-)Catherine: Yay! I hope he likes it (and you, too)! I bet my boston terrier would do the same thing with a salad. He eats just about any vegetable but isn't a huge fan of lettuce!Amanda: Aw, thanks! I plan on blogging regularly from now on...at least until we have to move again!! Your casserole might make me eat tuna (not a fan)... maybe I will make it with chicken instead... it really looks so good. I love it that you have that binder with your mom's recipes. I miss asking my mom cooking questions so much. There are still a few recipes of hers that I wish I had. (And good to know I'm not the only blogger who has a recipe that uses canned soup! I rarely use it any more but I agree, it's good for some things. ttfn300: That is a perfect idea! A book of family recipes would make a wonderful wedding gift! Patsyk: I'm sure it will be good with chicken but you should really try it with tuna first! Try using the the white albacore rather than chunk light...it's closer to chicken ;-) Kalyn: I'm sure there are plenty of food bloggers that still have a place in their heart for these types of recipes! I see nothing wrong with it! TastyNewEngland: Thanks for the tip, I'll search for the Martha recipe and see how she does it! Well I have Mac and Cheese "homemade" in the oven as we type. Son and DIL are coming and they're veggies lol. Your recipe here sounds YUM tho. So I've printed it out and will try it later this week!! My mom made this recipe when I was little, too! It originally came from the Favorite Brand Name Recipe Cookbook, I believe, or its sequel. The cheddar cheese addition sounds good. Our alterations: shell pasta (perfect for catching saucy goodness) and canned cream of chicken soup (for the picky non-mushroom eater - oh wait, that's me)! I just made the same exact thing! Idea courtesy of my Mom. The only thing i did differently was I didn't use bread crumbs and I put the grated cheddar cheese on top for a crispy crust...my roomates turned their noses at it, but it's VERY comforting food, for some reason. That is the yummiest looking tuna casserole I have ever seen! What a great comfort food!Anything that involves pumpkin is a comfort food for me! I've never had a a tuna casserole... can't even imagine the taste. But I've been hearing from people all around me lately that it was their childhood comfort food so I'm anxious to give it a try. Thanks for the recipe, Nicole. Kelly: Shell pasta would be great! I've recently started using that for mac and cheese since it holds on to all the cheesy goodness better than elbows! Joe: I sometimes put grated cheese on top, too! Although usually throw some crumbs on top of that! Can't have too much cheese :-) Meg: Thanks! I love pumpkin things, too! I'm sure some new pumpkin recipes will be popping up next month. Stay tuned! :-) Caviar and Codfish: I hope you give some version of a tuna casserole a try someday! There are many variations out there floating around! Comfort food always has to have carbs -- lots of carbs. For me, mac and cheese or tuna casserole are the epitome of comfort food, the things my mother made when I was young. ok i am one of the last comments:) It is so funny because i just made this before you put this up. And the reason was i was craving my mom's comfort food. Which of course includes her tuna casserole, tacos, potato salad and fried chicken. And my fav from my mother in law--her mac n cheese. Yummy! Well loved this blog Nicole. Love to hear about ur family memories. And has it really been like 15 yrs since we moved out to Oregon?!! Wow time flies. Fall is definitely here in our neck of the woods. The leaves have changed, the temperature has dropped and my tummy does not thing but crave comfort foods exactly like this. I can guarantee that this will soon be gracing out tables!Great to have you back. "sometimes the handwriting can be as comforting as the food." Your words are so true! Thank you for sharing your recipes and cookbook! When each of my daughters was married I gave them a compilation of their favorite recipes ~ The Big Green Book of Good things to Eat. I hope they will keep it as long as you have kept the one from your mother. I know they refer to it often. By the way, tuna casserole is one of my spouse's favorites. I guess I better get in the ingredients and make him one. He deserves it. 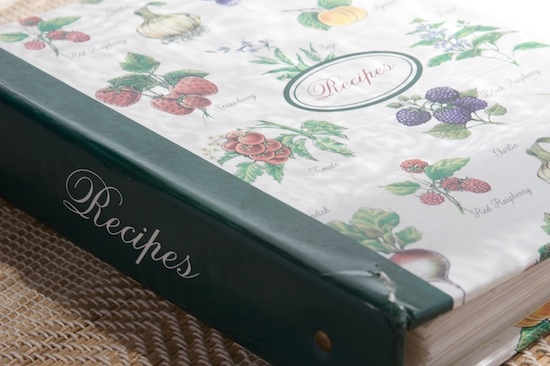 What a treasure that you have a cookbook with hand-written recipes from your mom! I can't remember the last time I had tuna casserole, but I do believe that it's been too long. That's the way I've always made it, except either with no veggies in it or frozen chopped broccoli, thawed. I am on Day 3 of a 2-week family experiment. We are not buying anything for 2 weeks! I am making some homemade soup right now, but the dried beans are too slow to cook and won't be ready for dinner tonight. Since ordering take-out is not an option, I thought of tuna noodle casserole. I don't think we have frozen peas, nor egg noodles - I'll try a variation of this one, with penne pasta, tuna, and who knows what else. But I'm happy to have found this website to give me some inspiration and a quick dinner. Thanks for the ideas! Wish I could follow it exactly - maybe next time! I'll write about it on my blog at Planet Perepctives. I made this last night and it looked exactly like yours. I am not a huge fan of tuna so I might make this with left over chicken the next time I roast one. this is the reason that i put your website on my favorites! it happened to be the exact recipe i was looking for and delicious pictures are helpful as well. it was perfect for 2 and leftovers for lunch the next day! i like your style! Thank you for sharing! I searched the web for this recipe and yours was the first to pop up. It is a rainy day here in Washington State and my husband is gone for 3 days. I told my daughter I would make her something special for dinner (something my hubby does not like) :) Your recipe mirrors my mothers only she used crunched up potato chips for the topping instead of bread crumbs. I am going to the kitchen right now! Thanks again! Your blog brought a tear to my eye. I lost my grandmother last month. She was 96 so we had her around for many years, I just don't think we cherished her near enough. Anyway, when family members were asked if there was anything they wanted from her house her recipes and family photos were the only things I cared about. I've since been working on scanning them for future generations. Everyone will be able to enjoy her "handwritten" recipes.Also, when my brother got married I gave his wife a recipe binder full of our families favorite recipes. She was thrilled. Thanks for the recipe, you're an angel. I googled "tuna noodle" and found this. So simple and delicious, and not too much...perfect for my family of 3 (I always make too many servings). I'm pregnant and nothing seems to be appetizing, but just reading the recipe and looking at the pictures is making me hungry...you're awesome.Sorry about your mom. I also enjoy my recipe cards written by my mom too. I feel connected to her just seeing her handwriting. Thanks again! Thank you for posting this recipe. I grew up eating Tuna Helper. I have tried making homemade tuna casserole in the past, however, the results were never that great. You pictures have inspired me to try again. None of the recipes I have tried in the past instructed me to mix the breadcrumbs with melted butter, and I am sure this makes a huge difference! I will be making this soon. Love your site! I have this in the oven right now and can't wait! I added a little Marsala wine to it and it smells great. Thanks for posting this! I made this for dinner tonight...Yummy! I wanted something easy that I had all of the ingredients for, and this won. It was delicious and I like that it's not a huge portion. : ) Thanks for sharing this recipe. 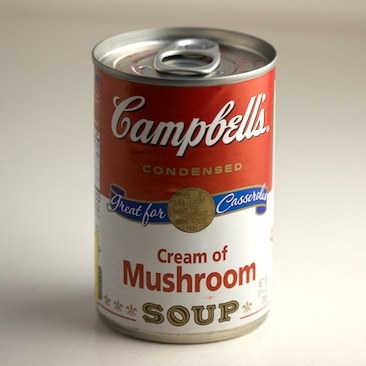 This was far and away my favorite dish as a kid, especially because it was so easy to make.Tip - measure the milk by half-filling the can of cream of mushroom soup. helps you get out more of that goodness.I sometimes crush up Have-A-Chips or Ritz crackers instead of using breadcrumbs. Also I add a dash of seasoned salt, maybe garlicsalt or onion powder.Also delicious with cut-up asparagus and/or olives! wow that sounds great..does anyone have any suggestions as to how to avoid using the Campbells soup. I just do not want to add that to my family's diet. Thanks. i love your blog. Thank you for all the great ideas! I've made a few different versions of tuna casserole from scratch (no processed ingredients), but haven't written the recipe. You can make a basic white sauce (bechamel) and use about 2 cups of it in place of the soup. I like to cook some finely chopped onions and celery in butter then stir in the flour and milk to give the sauce more flavor. Just make sure to season well with salt and pepper! Delicious! My whole family enjoyed this classic recipe! It's so nice to have another dish we all enjoy. Thanks for the dish! Tammy: Just use the regular size can of soup - not the family or single-serving size. Enjoy! I prepared this tuna casserole last night and it was truly delicious. I didn't have frozen peas but added a chopped green bell pepper. I did double the recipe. Comfort food at its finest. Thanks. I don't have time to read all the comments here but want to be sure no one follows the (incorrect!) 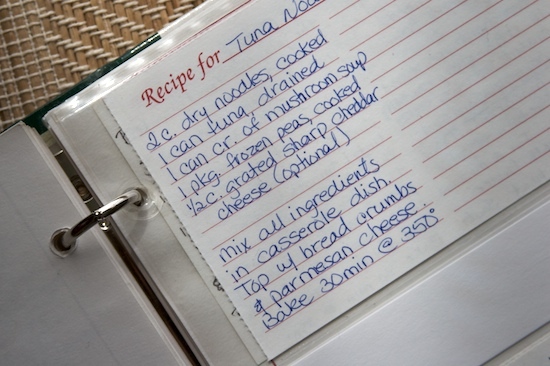 handwritten/book page recipe for Tuna Noodle Casserole like I did! Ok, I'm quite sure it should have occured to me NOT to put an entire pkg of peas like the reipe says but I had never made this before! I did have enough sense to fish out a lot of the peas after I mixed it together but what a hassle and there were still way too many! Anyway, be sure to scroll down and follow the website version, not the handwritten one! Followed your recipe but didn't have mushroom soup so I used organic veggie broth that I had used also to cook green beans. Added toasted onions, Lizzie's no salt spice, and some slivered almonds and the rest pretty much as you listed. One can of tuna was quite enough. The grownups really liked it. Thanks. In looking for web sites related to web hosting and particularly comparison internet hosting linux strategy Internet, your website came up. You really are a pretty sensible individual! Motte is probably droppable in a 10 team league b/c Larussa will likely not send the same guy out everydaybut I do think he is worth holding on to in deeper formats and keeper leagues.Reply # 68 sjglauber Says: April 10th, 2009 at 11:21 am I have Motte and Chris Ray, bleh. Holding onto to both, though. I love reading people's blogs, especially if they are about cooking. Thanks for the recipe! It is exactly the type of quick and easy tuna casserole recipe I was looking for. I also do not like to cook w/ Campbell's that often, but I love the cream of mushroom and occasionally cream of asparagus or celery. Happy cooking! Valuable info. Lucky me I discovered your web site accidentally, and I am shocked why this twist of fate didn't came about in advance! I bookmarked it. Thanks so much for this delicious recipe. My mom has been deceased for five years now, and today is her birthday. Guess what her favorite food was... tuna noodle casserole! Thus, I searched for a recipe and found this one. I made it and served it to my family tonight, and they loved it. Thanks for the recipe..it brings back happy thoughts of my mom and my childhood! In the casserole.. I'm far from being a good cook. I'm still using box meals for my dinners but I was wondering do u have to use frozen peas if fresh peas from the can are on hand does it make a difference in taste?? Chantell- In my experience, frozen peas are just as good as and sometimes better than fresh peas. They are usually flash frozen just after picking, so they retain the sweetness of fresh-picked peas. In a casserole like this, I wouldn't worry about seeking out fresh ones. Enjoy! Searched today for a homemade noodle casserole recipe and your blog popped up. As I read this post, I knew I had to try this meal. I can't wait to read through all your other recipes and stories and get inspired. Thank you for creating this blog! I just wanted to say, what a great gift that recipe book was! I hope to remember and do that for my children. I lost my mom 10 years ago, and what a treasure it would be to have a recipe book in her handwriting. It's the little things, isn't it? I am sure she wasn't thinking you would treasure it b/c of her handwriting. Thanks for sharing! John: It's called a food BLOG for a reason. Maybe you should shut it and go buy yourself some Tuna Helper. 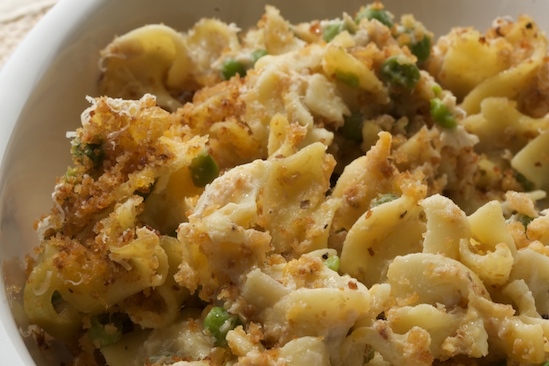 Tuna Noodle Casserole is one of my all time favorites. When I am feeling like poop its my favorite food to make. This is the Campbell's soup recipe ! My husband has been bugging me to make tuna noodle casserole...the Campbell's recipe. So glad I found it there. The photos make it look so good. I'm not usually a t-noodle casserole girl but this looks so good I probably will become one! Made this last night - SO GOOD. I doubled the recipe and only had one can of cream of mushroom soup, but had a can of cream of chicken so used one of each. I think I'll do that from now on. This was exactly what my husband and I were craving. Thanks, Nicole! I made this last night. I doubled the order so I'd have leftovers all week. My room mates got a wiff of it cooking, and now there is barely enough left for dinner tonight ! Everyone had seconds. Cooked the casserole this evening. Before I got started, I added some flavor enhancements, as the recipe as it stood seemed rather bland to me, with all due deference to you and your mother. :) I added: seasoned salt, black pepper, a few shakes of dry mustard, and plain panko bread crumbs. The casserole is very tasty. Next time, I'm contemplating evaporated milk for regular milk, and seasoned panko bread crumbs for plain panko bread crumbs. My mother gave me the exact same book when I got married at 23. She sprinkled in recipes from guests at my bridal shower. It's been a staple at nearly every cook session since. Thanks for the tuna recipe. Smells like home. 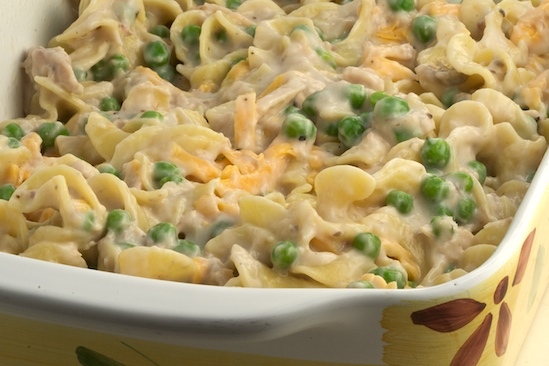 Our family recipe for Tuna Noodle Casserole is similar but easier (and lazier) but really good...3/4 bag of Extra Wide Egg Noodles 1 can Cream of Mushroom Soup 1/2 cup of Milk 2 small cans or 1 large can of Tuna 1 can of peas and carrots (takes away the cook frozen peas step)Make noodles. When noodles are done, drain. Add noodles, cream of mushroom, milk, tuna, and can of peas and carrots to pot. Eat. Getting best from food is a task, and you did it in a good way.Our family recipe for Tuna Noodle Casserole is similar but easier (and lazier) but really good… 3/4 bag of Extra Wide Egg Noodles 1 can Cream of Mushroom Soup 1/2 cup of Milk 2 small cans or 1 large can of Tuna 1 can of peas and carrots (takes away the cook frozen peas step) Make noodles. When noodles are done, drain. Add noodles, cream of mushroom, milk, tuna, and can of peas and carrots to pot. Eat. how many do you think this would serve?